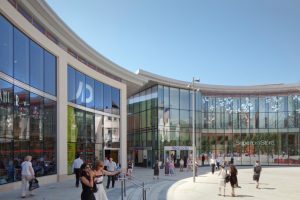 MINIMISING the trauma when a child goes missing is the aim of a new scheme launched by Woking Shopping. Every parent can identify with that terrifying feeling – you’re out shopping and you suddenly find your child isn’t where you thought they were. The Child Safe Zones Programme aims to reunite lost children with their families as quickly as possible. Branded ‘Child Safe Zone’ stickers are on show around the centre displaying a direct number to Woking Shopping’s security team in the CCTV control room. In the event that a child becomes separated from their guardian the security team will immediately action their search procedure. Th e initiative provides children with free wristbands for parents’ or guardians’ contact numbers so that, in the event of a child being lost, the parent or guardian can be contacted quickly. The wristbands will be available free of charge from distribution stands in both Peacocks and Wolsey Place. Families should look out for the Child Safe Zone’s smiley orange balloon stickers on shop windows throughout Woking Shopping, displaying the helpline number 0844 619 1200. Anyone losing sight of a child in their care or any shopper finding a lost child can call the number on the sticker to speak directly to the security team.